Today, agriculture makes up to 73% of the UK’s land usage with management systems that focus on productivity and efficiency. An intensive form of land use that sprawls across England and towards the wilder frontiers of Scotland and Wales. The balance between agriculture and the natural environment is not only a hot topic but also an off-shoot to the dilemma of population growth. While the population of our species ever increases, land management efficiency comes under ever-increasing scrutiny. The socio-economic reciprocity between economics (produce) and social philosophy (ethics) is already heavily entwined within the landscape. With the need for food increasing and our existing land already heavily farmed and ecologically damaged, could we find additional commercially alternative sources of nutrition within timber forests or wooded areas? Would this add an additional burden to the services already in place? The relationship between tree and produce is already key in the discussions of food security, carbon sequestration, soil erosion and flooding defence. The current, conventional perspective views agriculture and forestry as separate, which has led to a ‘one or the other’ approach. The industrious timber forests of the UK are not widely perceived as a place to commercially source edible produce, yet small-scale NTFP operations are commonplace, such as hunting, fishing and subsistence foraging (for nuts and seeds, fungi, nectar, saps, stems, tubers and leaves). NTFPs are woven into the fabric of the natural eco-sysem yet in temperate, single species crop production systems they are considered a by-product of happenstance rather than an intentionally developed product in a long-term plan. In-depth studies into the commercialisation of NTFPs are few and far between, while paradoxically, placing a true economic value on non-timber forest products is a major objective in forest policy. However, some businesses are thriving; from small scale cottage industries to prosperous gourmet food wholesalers who supply thousands of pounds’ worth of trade to upscale retailers. The primary harvesters of NTFPs are private gatherers, obscurists by nature and their relationship with the private landowners or forestry commission is congenial at best. Their work is intentionally inconspicuous due to the legalities of collecting, leaving little evidence and understanding to their methods and quantities. The black hole of knowledge becomes a hurdle to any who wish to pioneer the industrialisation of the forest for food produce. An antitheses as economic interests in the development of NTFPs are on the incline. Agroforestry is a globally practiced discipline of timber production within an agricultural landscape. The benefit of the tree interaction is the addition and consequent improvement of the nutrient cycle that aids crop yields, supports ecosystem services and provides cultural benefits. Simultaneously, assisting the economics of high cost agriculture with the behindhand revenues of forestry. 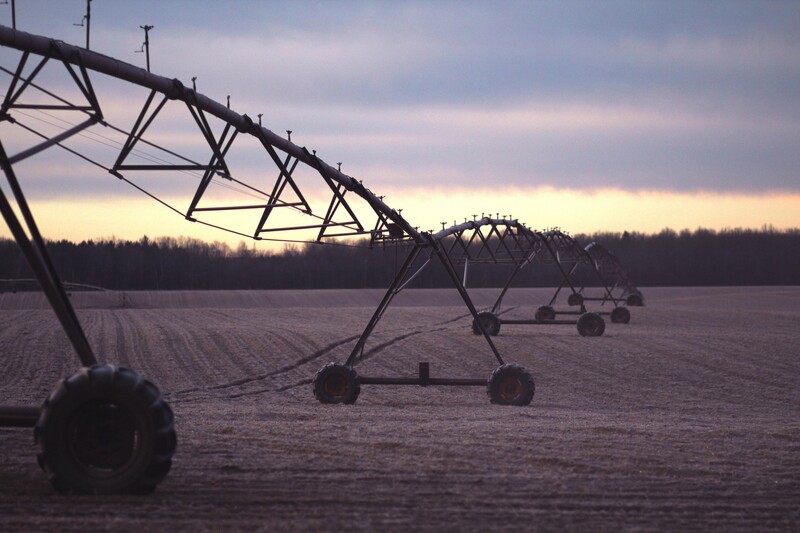 Long-term and regular dividends are cultivated, offering landowners a different option within the turbulent agricultural economy. The two conventional Agroforestry systems are silvoarable (tree and crop); alleys of crop alternating with rows of trees and silvopastoral (tree and freely grazing animal); imagine sheep in an orchard. 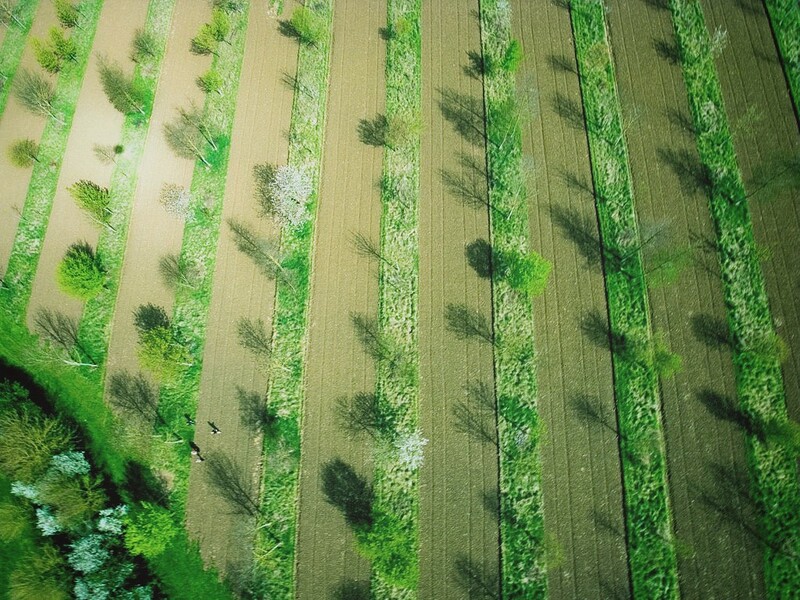 Each Agroforestry system is unique, as the natural resources of site dictate which tree and crop can be selected. The relationship between the tree and crop also denotes the species selection; making for a complex and holistic design. The UK’s population to relative land mass ratio is one of Europe’s highest with 267 people per sq. km. The annual growth is a minimum of 0.6% or 348,600 people, equivalent to a city larger than Cardiff. Contrary to popular belief, only 10% of England is under concrete. However that is predicted to grow considerably with the rise in population and lack of housing. Holistically and importantly, all land is finite. The rich tapestry of the English landscape should be the natural food basket that provides perishable produce fit to fuel a nation. However, the overburdened land with its numerous demands already cause tension for many a policymaker and public alike. 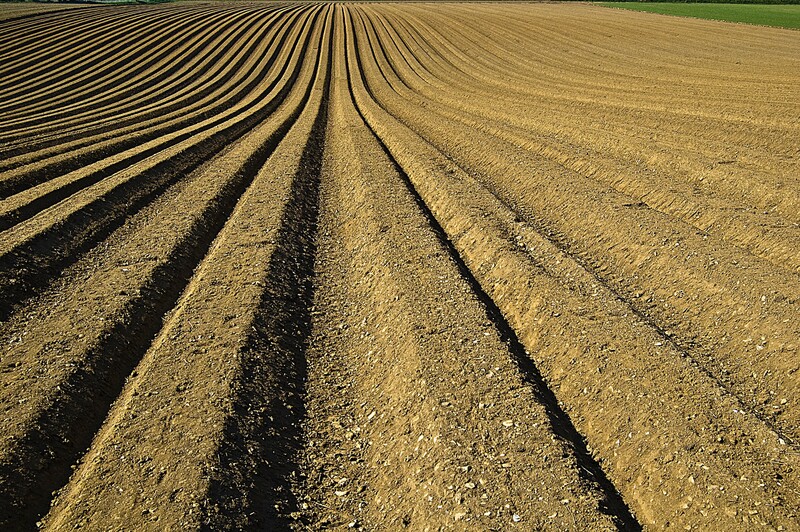 Britain falls short of self-sufficiency as our yields of essential crop fall and productivity in certain areas face unprecedented climatic changes and soil erosion. An authoritative and pertinent government policy addressing these sincere and systematic challenges is to be found wanting. As of 2015, the UK government has no active policy that acknowledges the pressures caused by overpopulation on the nation’s land usage. It is deemed that only a third of the Earth’s soil is suitable for agriculture, with 30% expected to experience erosion by 2050 due to unsustainable agricultural practices. Simultaneously, our decline in careful land management and incline of yield quantity is tearing the natural physical systems in two. If the current business-as-usual approach continues, it would repeatedly accelerate the substantial damage to the biological and physical systems that sustain us, an overall decline in per capita food production and an impossible task of tripling the current requirement. It seems, therefore, that preparation should be taken to welcome the unprecedented advances that are to fall upon the world’s natural resources; the demands upon the world’s forests are to change rapidly. 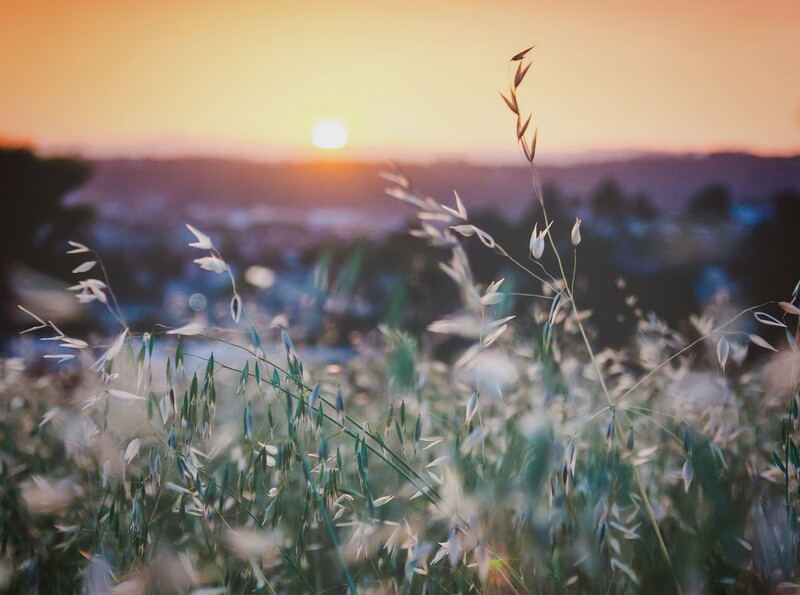 Currently, the UK has 24 million hectares of land, the amount available to provide for our ecological and provisional needs per individual is less than half a hectare for each person and its is shrinking. By 2033 the UK population is expected to have grown to 71.6 million, that increase is relative to adding another London. That type of growth in such a small timescale would intensify the need to address our societal and industrial infrastructure with an immediate effect. The United Kingdom’s single greatest manufacturing sector is the supply chain of consumables, which accounts for 7% of GDP and is worth £80Bn per year. However, the UK still imports 40% of the total food consumed (and rising). The multifaceted threats upon humankind are widespread and interconnected, if crops fail in the Far East then they fail in the UK by deed poll of the international food supply chain. If one considers the political, economic and climatic changes that are to trouble the more ‘unstable’ countries from which the UK imports, a break in the chain would have a domino effect on the entire food security system. Sustenance and Sustainability are of paramount national importance. In broad terms, to become self-sufficient a mass land registry of the UK is required and then scrutinised. Scotland is a contemporary example where ownership of land becomes forefront in the design of future national incentives. The effects of overpopulation on soil exhaustion will propel a spiral of failures. The accelerator of productivity hits the floor to meet demands, simultaneously, arable land will therefore continue to lose quality soil as the rate of harvest and extraction is faster than the rate of soil formation. Intensive cropping without compensation of organic matter and denudation of heavy overgrazing would be the top two causes of its decline. The faster we try to meet demand, the faster we fall behind. The need to maintain food production and the need to preserve the nation’s tree cover means that the two must be aligned and integrated. An agroforestry system is a prime example of a positive balance and in practice there are three main steps that make it a success. Step 1 — Mitigate land degradation and erosion by planting nitrogen-fixing trees and shrubs, benefiting the restoration of soil fertility. Step 2 — Protect existing trees while methodically planting new ones so to produce additional marketable products that are local to their provenance, in turn, creating Agroforestry Tree Products (AFTPs). (AFTP’s are private property and intentionally grown whereas NFTPs are colloquially considered open property). 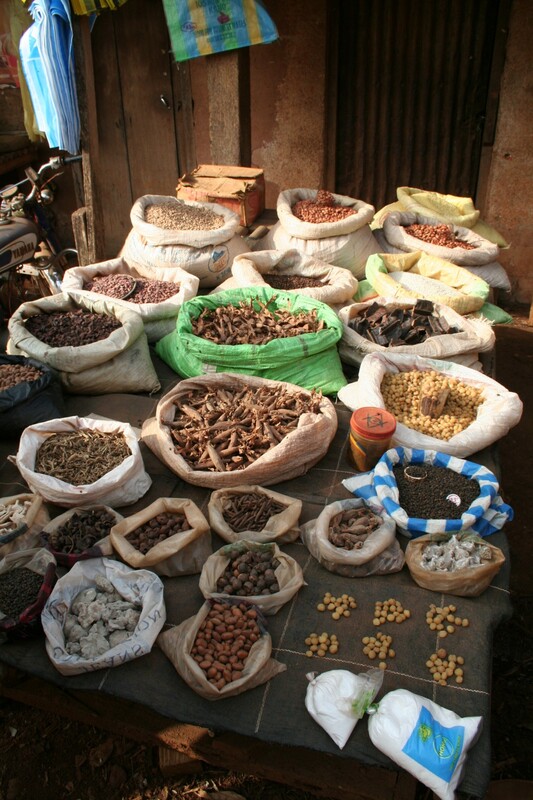 This tree domestication enables farmers to add another harvestable/marketable resource. Step 3 — Reward farmers who develop value within their systems or pave the way for new Agroforestry technological advancements; schemes such as ‘Payment for Environmental Services’ (PES) are a good example of this. In the image below, an illustration is provided to promote a theory for the best future practice. The theoretical model developed shows the gradient between the two disciplines of NTFP’s and Agroforestry as one corresponding method, prescribed in the areas of land that balance between wooded or forested areas and monocyclic agricultural practices. Agroforestry’s productive system is designed purposely to produce crop while offering different benefits. 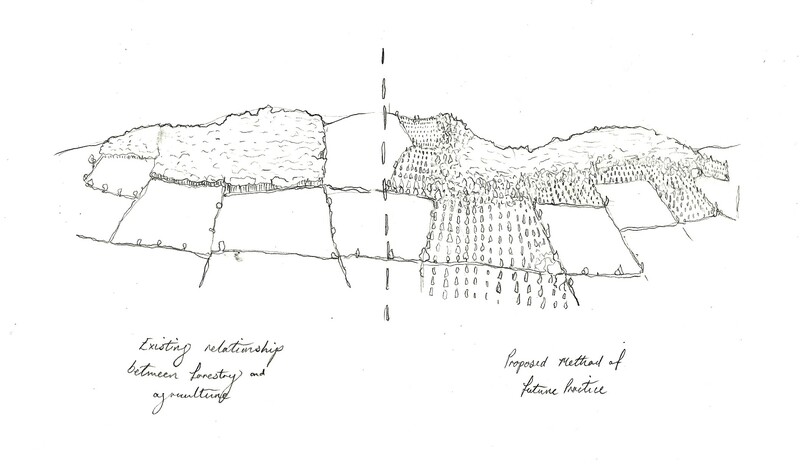 In this theory, Agroforestry becomes the start/end of a gradient into Forestry. In effect, this theoretical model provides economic and production efficiency with a minimum compromise on yield while satisfying environmental services. While taking a detailed look at the silvicultural aspects, one can see the productivity potential further. Within a forest, imagine NTFP production is already implemented. When the forest is thinned out to help existing trees grow or provide a revenue for marketable trees for additional revenue, the forester would also target timber-for-waste trees (those that have died or are not growing at a semi-decent standard). These timber-for-waste trees become the substrate for fungi. 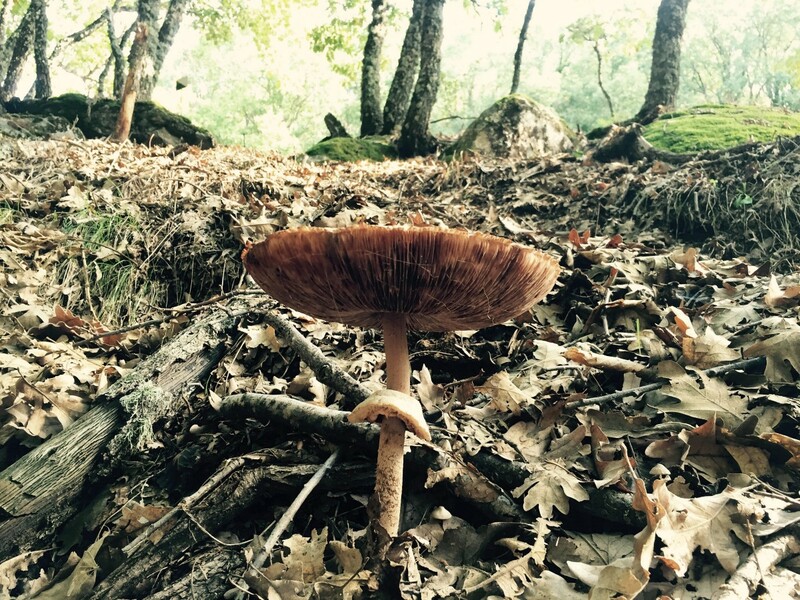 The benefits of Mushroom production contribute further than simply sourcing food and revenue, the nutrient cycling from deadwood returns the primary components back into the soil. Research has shown that the nutritional value of mushrooms is of great importance, particularly when having to initiate efficient objectives to food security. Mushrooms have a relatively high protein content, typically 20–30% crude protein. High protein content makes them ideal because they contain all the amino acids essential to human nutrition. There are about eight essential amino acids, that is, those who cannot be produced by the human body, and so must be consumed in the diet daily. Mushrooms can be an important dietary source of these amino acids. The discovery of a single strand of fungal protein (Mycoprotein) derived from the species Fusarium venenatum that was growing in Buckinghamshire during the early 1980s, instigated the birth of an industry; Quorn™. Fusarium venenatum is related to truffles and morels by the family genus Ascomycota. The genus’ structure is an intricate web of tiny filamentous strands; similar to the composition of muscle. In comparison to braised beef, Quorn™ has only half of the total protein but more dietary fibre and carbohydrates, dramatically less fat (both saturated and non-saturated) and lower cholesterol. Therefore, it provides the perfect alternative to meat in every way; a cheap and readily available food source that doesn’t require dramatic and intensive land use (which is necessary for meat production). 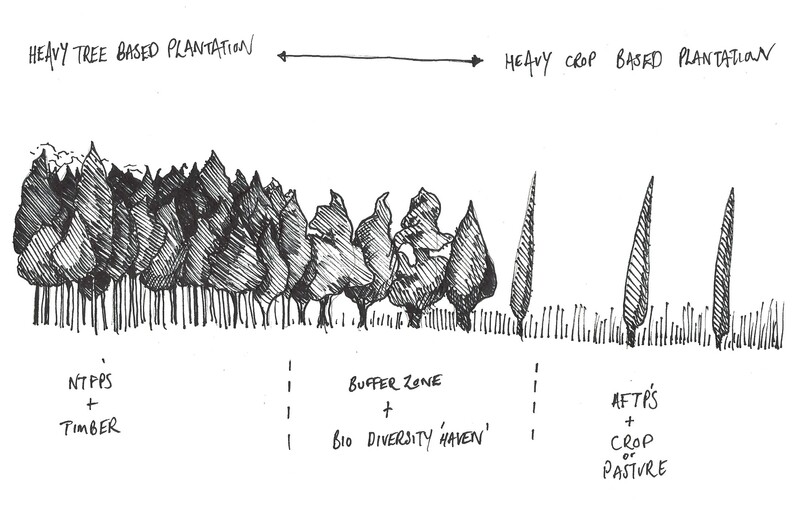 Within the image above, the Buffer Zone provides excellent value in its efficiency by supplying a wild area (for the progress of biodiversity), safeguarding the forest by reducing dangerous chances of windthrow and a place to harvest wild edible produce. Such as Wood Sorrell (Oxalis corniculata), Wild Garlic (Allium canadense), Nettles (Urtica diotica), Berries, wild salad leaves, Fennel (Foeniculum vulgare) and Sweet Cicely (Myrrhis odorata). Occurring at the fulcrum of the theory’s gradient and the outer edge of the stand, tree density would dissipate into a wider spacing of trees at an appropriate distance classified by the individual site. A wide spacing provides light for open vegetation to incorporate ectomycorrhizas (EcM), edible truffles, into the root systems of host trees. The challenge with this idea is finding the precise balance between removing non-productive competitor trees so natural resources are available to the productive brûlés, while retaining enough of the natural bio-diverse environment for biomass to flourish. Topography plays an important role on the method of future practice, as soon as fluctuations appear in the terrain’s contours, a ‘horses for courses’ adjustment of the Agroforestry system would be required. The main design template of a traditional system is rows of evenly spaced (preferably mixed species) trees interlaced with crop or pasture. The image below offers an elevated viewpoint of rolling topography with both existing and future practices. The preference of mixed species plantations assists in the overall natural look of the diverse countryside. Change is the only permeable; it is clear that the demand on natural resources will increase to unprecedented levels. Forest management has a significant role to play in efficiently producing commercialised NTFP’s in the UK, Agroforestry has an honest claim to help input nutrients back into the soil. The diversity of NTFPs provide many varied opportunities, the cultural aspect of Agroforestry has the potential to colonise the landscape. Research is urgently needed to take cottage industries and turn them into commercialised enterprises. Information needs to be released and shared. The broader and pertinent questions of the national land usage need immediate reconciliation. If you enjoyed this article, I would be most grateful if you could share the love through Social Media and join my newsletter.